With over 25 years of experience, MediVisuals has developed thousands of exhibits for a variety of products liability, personal injury and medical negligence cases. 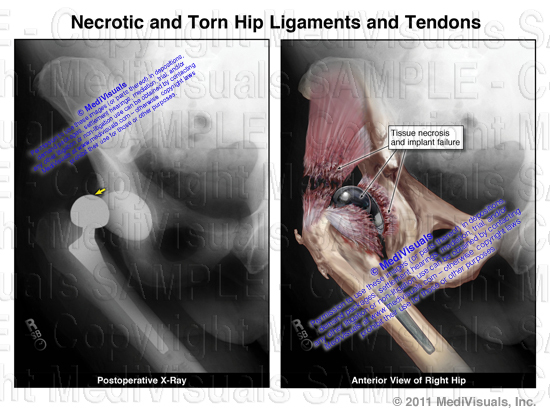 In order to best assist our clients with the current metal-on-metal hip replacement litigation, we are working to develop dynamic and truthful medical illustration and animation exhibits to effectively demonstrate the mechanism of failure and the recipients' resulting injuries. 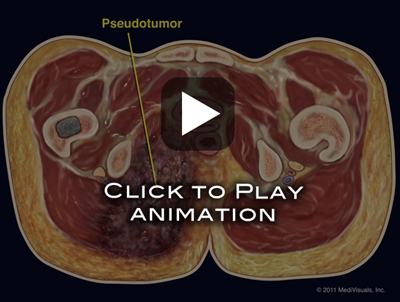 Please review the medical illustrations and animations below. If you have any questions or would like to use any of these exhibits in a presentation, deposition, mediation or trial, please contact Bob Shepherd via email at bshepherd@medivisuals.com or call 800-899-2153. 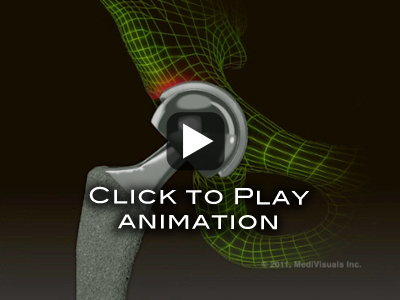 This animation shows one of the common complications associated with the metal-on-metal hip prosthesis, a pseudotumor, caused by the reactions of adjacent soft tissues to the metals that are dispatched into the area of the hip joint. This animation sequence focuses on the metal on metal wear and how placement of the acetabular component at too steep an angle both increases the pounds/mm2 pressure as well as greatly increasing the pressure on the edge of the acetabular component to increase flaking and ionization. 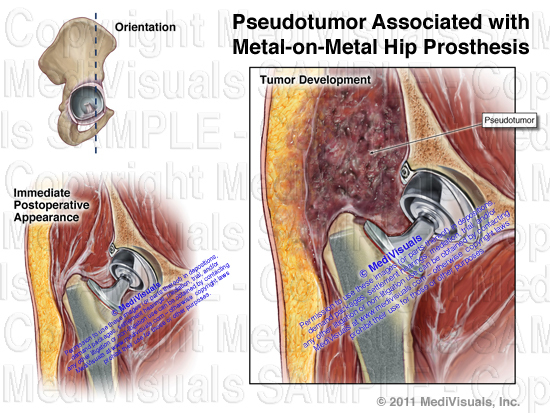 This image shows one of the common complications associated with the metal-on-metal hip prosthesis, a pseudotumor, caused by the reactions of adjacent soft tissues to the metals that are dispatched into the area of the hip joint. This image shows torn hip joint capsules and muscles as a result of their weakening and breakdown, in response the metal fragments and ions released into the hip joint and surrounding tissues.